This area was once known as the Rowlett community. It was one of the earliest communities in Collin County. Many of the early settlers here had been neighbors in Illinois. Rowlett Creek Baptist Church is said to be the earliest Baptist Church in Collin County, starting in 1848. It was active in the Elm Fork Baptist Association. Out of this church came most of the Baptist churches in Collin County and both First Baptist of Dallas and First Baptist of Fort Worth. The church was disbanded around 1935. The present chapel was built later as a memorial to the old church. It can be used for funerals or special occasions. The cemetery covers several acres of land. It was started in 1862 and was associated with Rowlett Creek Baptist Church. There is a creek on the north and east of the cemetery. The creek on the east is West Rowlett Creek. The cemetery is fenced with an old wire fence and has an arch at the entrance with the dates 1895 -1920. 1895 was the year that the cemetery association was formed. There is a historical marker behind the chapel. The gates of the cemetery have been kept locked lately due to continued vandalism. The cemetery association holds Decoration Day in May each year. The cemetery is still in use and is very well maintained. Next to the chapel there is a commemorative for George White, who donated part of the land for the cemetery. 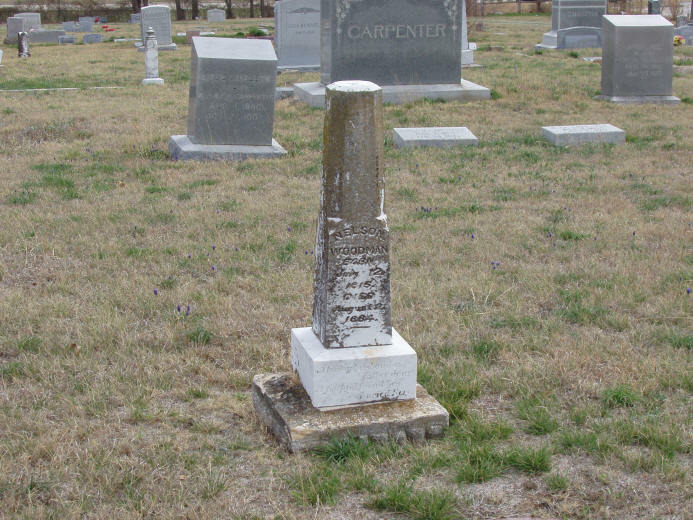 He was a surveyor, who platted both Rowlett Creek Cemetery and Pecan Grove Memorial Park in McKinney, where he is buried. When I was there, the commemorative for George White was broken. It has since been repaired. The deed for the cemetery, listed in Vol R, p 385, includes a plat map of the cemetery made by George White. Shadrick Jackson, Jr. donated 4 acres of land to the cemetery in 1862 and was one of its earliest burials, dying in 1863. The cemetery association has bought and sold land over the years. This cemetery contains more Peter's Colonists than any other cemetery in the county. It also contains the graves of some of the ancestors of LBJ. There is a good history of this church and cemetery written by Miss Lucy Rasor. "This is our family, three children. Thou knowest I love Thee dearest Lord. That dare to rivle Thee." UNITED BAPTISTS IN 1848, UNDER LEADERSHIP OF THE REV. 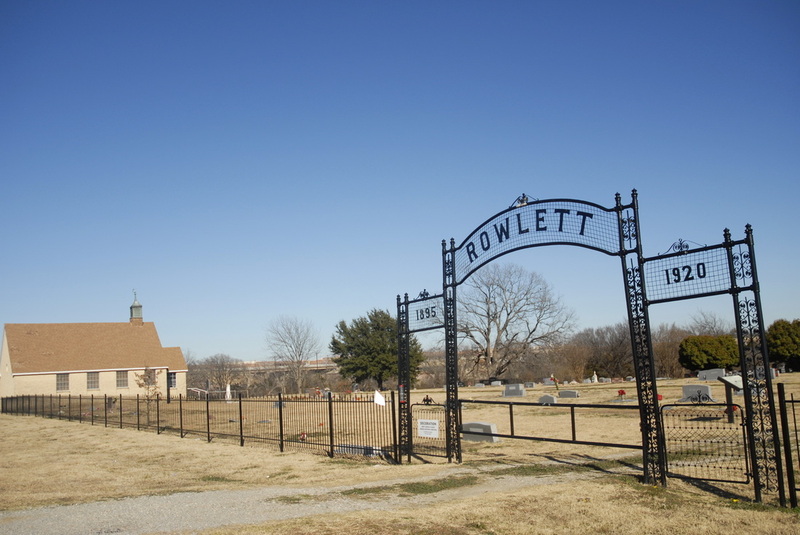 THE ROWLETT CREEK CEMETERY ASSOCIATION WAS FORMED.